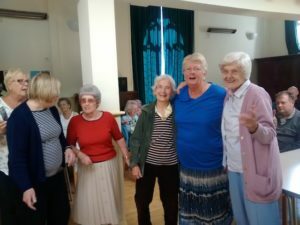 New Horizons, the club for older people in the area, has had another great month with entertainment and outings. One of our favourite musical groups, the duo Past Times performed for us recently. The tunes from the 50s and 60s had everyone out of their chairs and dancing enthusiastically. We also had another lovely day by the seaside at Felixstowe. Our visits to The Hut are always so enjoyable, with walks or wheelchair rides along the prom and of course fish and chips as a lunch option. If you are 55 or over, why not come along and join us for a trial day of fun, friendship and activities, along with a delicious home-cooked two course meal? 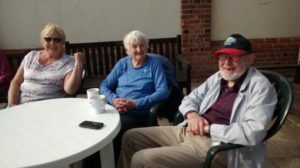 There are always a variety of activities on offer, and time to sit and chat with a cup of tea or coffee, too. The cost for the day is £8.00 plus a small additional fee if you require transport. New Horizons meets twice weekly on Mondays and Thursdays from 10am – 2.30pm at St. Mary’s Church Hall, 11 Market Hill, Woodbridge, IP12 4LP. For more information and to make arrangements, please phone 07514 364752 and speak to one of our leaders.